Extremly fast universal programmer with 48 pin-driver. USB2.0 connection. As good as every(!) device is supported. 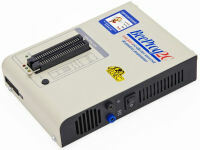 With jack for in-system-programming (ISP), integrated power supply. 3 years warranty. Up to 4 programmer could be attached to one PC!